Maulvi Izharuddin (2003, 20180930) erformed the annual hajj pilgrimage every year except 2018 with 10 to 14 officials of his department and some ulema and all their expenses were paid from the government budget. 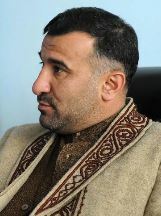 Fidai was born on December 28, 1970 in Sultani Village, Sharan district of Paktika Province. He is married and has four children. Fidai holds a master degree in public relations, media and communication as well as degree in educational science and a 3-year diploma in English language. He has received over 50 trainings both in home and aboard in management, leadership and communication areas. Kilid says Fidai has links to Gulbuddin Hekmatyars party. Fidai has worked for over 14 years with international not-for profit and for-profit organizations mostly American NGOs delivering services in the areas of Education, Emergency, Relief, Development, Civil Society, Human Rights, Women Empowerment and Public Administration. He has extensive experience in management, administration and development areas. Fidai has also been the founding President of the South Asian Free Media Association (SAFMA) Afghanistan for 18 months. He has remained as the editor, reporter and journalist during his work with various Afghan media organization as well. Fidai enjoys strong relations with the population from all parts of the country and with the international community working in Afghanistan. Fidai’s native language is Pashto, however, he can speak and write Dari, Arabic, Urdu and English fluently. He has widely traveled to the countries of Central Asia, South Asia, Europe and Middle East. Fidai has been the member of the following networks: Central Euroasia Leadership Academy (CELA), Center of Coordination of Civil Society Organizations, Afghanistan Independent Journalists Association, Paktika Social and Developmental Society, Pajhwok Afghan News Agency, and other adhoc networks. Syedabad district, has recently emerged as one of the most vulnerable districts of Wardak province. Also in the same district, the governor Mohammad Halim Fidaee escaped an attempt on life February 2010. Four ANA soldiers lost their lives as a result of the explosion targeting the governor. He is a member of President Ashraf Ghani‘s Change and Continuity team. Fedai was appointed Provincial Governor of Khost Dec 27, 2018.